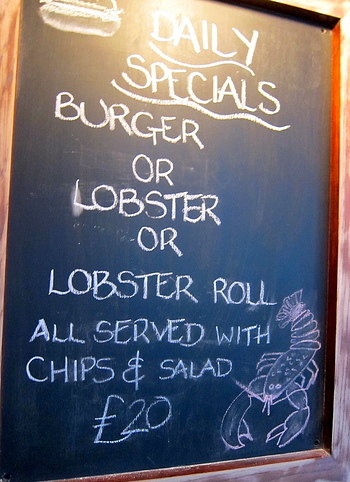 Burger and lobster- the name really is the programme in this Mayfair based restaurant, currently the talk of the town. Because at Burger & lobster the choice really is only between burgers and lobsters - for twenty pounds to be precise a choice between a whole lobster, a lobster roll or a burger all served with unlimited fries and side salad. It might sound like a novel idea and I was a little dubious having not really had lobster before but the simplicity of its premise and the brilliant way it is executed here have made it one of my new favourites in London. Whilst Mayfair isn't exactly known for its affordable eateries here for £20 you get to feel extremely looked after with great service and a little special, after all lobster isn't exactly everyday fare. The dinning room itself may not be anything special but here it's the food that does the talking and after my first of hopefully many more meals there I can totally understand why the queues have increasingly build up so get there early or be prepared to wait a little to get the ultimate lobster fix because boy its worth it!